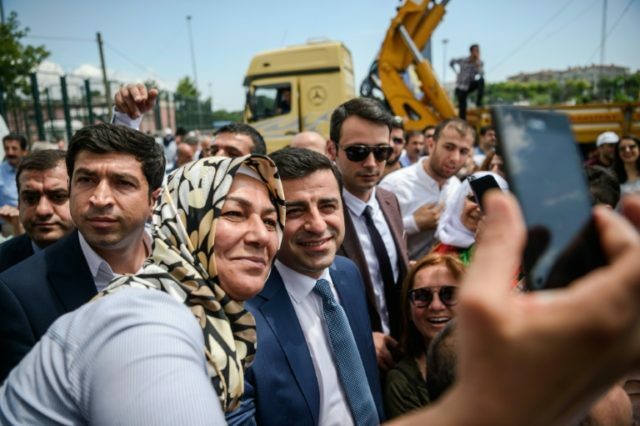 Ankara (AFP) – Turkey’s main pro-Kurdish party on Wednesday said its charismatic former leader Selahattin Demirtas would challenge President Recep Tayyip Erdogan in polls next month even though he is currently jailed. The announcement added new intrigue to the campaign for the June 24 polls as other opposition parties indicated they were set to join forces in an unprecedented alliance against Erdogan. Erdogan last month called the simultaneous parliamentary and presidential snap polls one and a half years ahead of schedule, seeking a thumping parliamentary majority and a new mandate after 15 years in power. The Peoples’ Democratic Party (HDP) said it had agreed on Demirtas as its candidate and his campaign would be launched in simultaneous rallies in Istanbul and the majority Kurdish city of Diyarbakir on Friday afternoon. Demirtas, 45, was a candidate against Erdogan in August 2014 presidential elections and led HDP into parliament for the first time in June 2015 polls. Dubbed the “Kurdish Obama” by admirers after the rhetorically-gifted former US president, Demirtas stood out in Turkish politics with impassioned speeches and a radiant charisma. But he was arrested in November 2016 in a crackdown that followed the July failed coup and put on trial in several cases, notably on charges of links to the outlawed Kurdistan Workers’ Party (PKK). The HDP replaced Demirtas as its co-leader in February this year after he indicated his political career was over while in prison. It was not immediately clear what had prompted the change of heart and how he can register as a candidate, let alone campaign, while in jail. The new co-leaders of the HDP, Pervin Buldan and Sezai Temelli, urged supporters to come out on Friday and celebrate the campaign launch. Demirtas is held in the northwestern city of Edirne, far from his Kurdish heartland. While in custody, he has written poetry, produced artwork and even written a selection of short stories entitled “Seher” (“Dawn” in Turkish). Meanwhile four other opposition parties were set Thursday to announce an alliance that would see them field joint parliamentary lists but separate presidential candidates. The alliance includes the secular Republican People’s Party (CHP) which would join forces with the new Iyi (Good) Party as well as the conservative Saadet (Felicity) Party and the centre-right Democrat Party. Talks between the parties were ongoing ahead of an expected signing of the alliance protocol on Thursday, a CHP source, who did not wish to be named, told AFP. CHP deputy leader Seyit Torun told state news agency Anadolu that he wanted the new grouping to be called the “democracy alliance” and that the parties had “united around principles”. The government lambasted the move as merely a ploy to oppose Erdogan at any cost, with Deputy Prime Minister Bekir Bozdag scoffing it was a “forced alliance like a forced marriage”. The alliance follows Erdogan’s own partnership with the right-wing Nationalist Movement Party (MHP) which is is supporting Erdogan’s bid for the presidency. Iyi Party leader Meral Aksener earlier Wednesday submitted her formal application to run for the presidency to the Supreme Election Board (YSK). The CHP is due to reveal its candidate to challenge Erdogan on Friday with most analysts at a loss to suggest a strong CHP contender. The June 24 polls will be a landmark in modern Turkish history. After the elections, a new presidential system approved in an April 2017 referendum which critics claim gives the head of state authoritarian powers will come into force. Demirtas has been a staunch and consistent opponent of the presidential system and Erdogan, repeatedly accusing the Turkish strongman of acting like a dictator. In a letter sent to the Cumhuriyet daily this week, he described the elections as a “breaking point” that would determine if Turkey headed to a one-man authoritarian regime or a struggle for democracy.